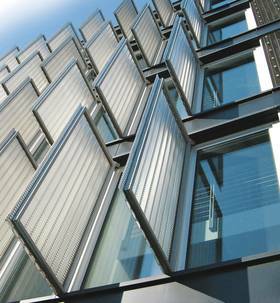 With the DEFLEX® sealing systems we have internally-developed solutions for all modern windows and facades. The material developed with regard to the aspects of energy and cost efficiency (EnEV) offers a free hand to architects and builders for creative structuring without compromises. As a German manufacturer, we place high value on consistent product quality and reliable material properties. With regard to employment in case of large-scale projects, DEFLEX®-sealing systems guarantees the highest levels of security and sealing, where our customers can benefit from long-standing experience and development. The sealing system DEFLEX®-Fassadenflex consistently relies on the principle “better sealed inside than outside”. Vapor-diffusion-open EPDM waterproof sheeting outside and diffusion-sealed butyl caoutchouc inside offer optimal sealing through ideally coordinated system components. Fibrous-mat laminated films characterize the innovative 3-layer DEFLEX®-Fensterflex system with effective energy-saving technology. Permanently-resistant, high-performance films guarantee secure sealing here. A system adhesive is available which is suitable for every film system. Seal energy-efficiently and save costs effectively! Completely vulcanized collars and special shapes are also available on request.